I like to warm up a little before I start a new project, this helps me relax and get back into using the pen and ink again. Take a pad of white paper, any paper really, and dip the nib in the ink. Start by drawing lines across the page (thin) and then vertically (thick). When you are comfortable with this, move onto letters. I did 'O' 'N' 'L' 'A' as these use different lines and shapes. Do this until you are happy to start on your name place cards. I usually work off my laptop and work my way down the guest list but it is a good idea to print off the list and mark each guest off as you write the tags. Make sure to include yourselves, I often create a few options; Mr, Mrs, Bride, Groom and do names too. DON'T WANT TO DO YOUR OWN? If you don't fancy giving this a go, or don't have time, head over to my shop where you can place your order and I will create them for you. 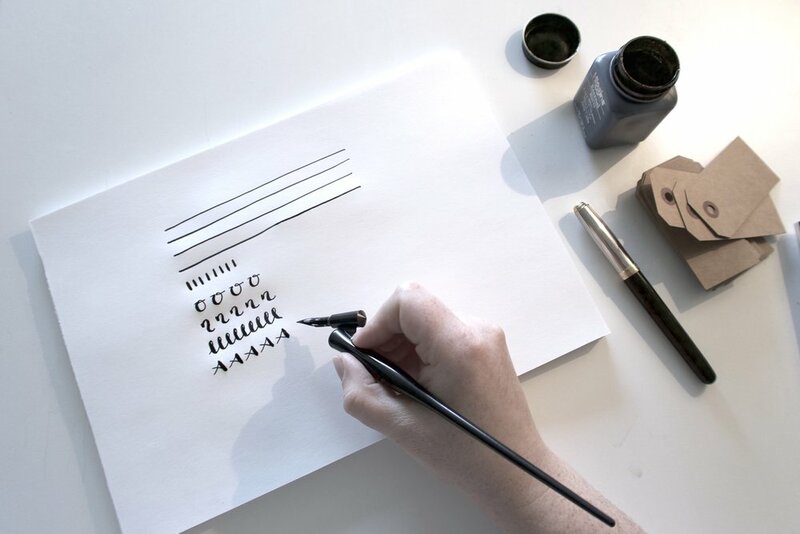 have you tried CALLIGRAPHY yet?